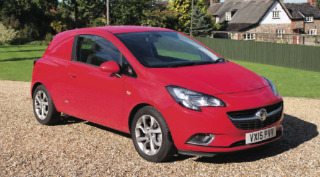 The compact car‐derived market is something of a niche these days, with Vauxhall and Ford the main contenders, offering Corsavan and Fiesta Van respectively. For those that want a small van that literally drives like a car though, these compact LCVs remain an attractive proposition. The fifth generation Corsavan has moved the game forward again, adopting a host of new technologies from Vauxhall’s car range. Despite the additional weight imposed by Euro 6 engines, the van also promises lower fuel consumption and emissions, with increased carrying capacity. The most efficient ecoFLEX models are said to be good for an incredible 88.3mpg, while even this range‐topping Sportive van posts a combined fuel figure of 74.3mpg. CO2 emissions are a credible 101g/km, dropping to just 84g/km for the ecoFLEX model. What’s more, those figures actually seem to be quite achievable. In general everyday driving, including a mix of local mileage and higher speed motorway work, the Corsavan delivered a very frugal 65mpg, thanks in part to a very active standard Start/Stop system. A bit of light‐footed eco driving would easily have seen that rise into the low 70s. It’s a very pleasant van to drive too. The 1.3‐litre diesel engine pushes out a spirited 95hp, with 210Nm of torque to keep things moving. Unlike lesser models you get six gears in the manual box with the Sportive, which makes for both rapid acceleration and relaxed cruising. You would expect such a compact van to be nippy in town and it doesn’t disappoint, darting for gaps in the traffic at every opportunity. What was less expected was its long distance comfort and the relatively smooth ride, even when unladen. As befitting its status in the range, the increasingly popular Sportive model comes packed with equipment, though even the base model is packed with useful tech. A heated windscreen, auto wipers and lights, electric windows and heated door mirrors, air‐con, cruise control, sports seats, LED daytime running lights, 16‐inch alloys, ESP, Hill Start Assist, six airbags, Bluetooth streaming, DAB, the list goes on. Our test van was also equipped with Vauxhall’s Intellilink infotainment system (£750), that lets you connect to your Apple or Android smartphone and use a range of apps directly from the touchscreen. This replaces a built‐in sat nav, as long as you have the necessary smartphone to work with the van. The only slight negative in the cab was the red and piano black dash, that comes as part of the Sportive pack. It is both reflec‐ tive in strong sunlight and a magnet for sticky fingerprints. Despite all of the additional gear that comes with this latest generation Corsavan, the compact Vauxhall retains a very useful 543kg payload in Sportive trim. There is 0.92m3 of load volume on offer too, with a surprisingly useful load area length of 1,257mm to the half height bulkhead. The load area is also relatively easy to access. Corsavan accounts for around 7.4% of Vaux‐ hall’s UK van sales, with 2,400 of the compact LCVs sold in 2014. It’s easy to see why 64% of those sales are to retail customers. Most fleets will probably head towards a high cube design, even at this light weight. But for those who put more emphasis on the driving experience, Corsa- van has much to offer.